CANTON, Mass. 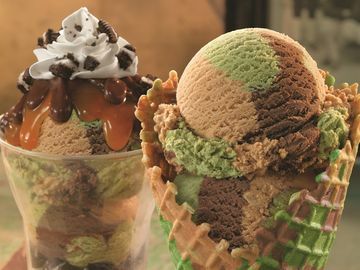 (April, 2011) – Baskin-Robbins, the world’s largest chain of ice cream specialty shops, invites guests to celebrate its fifth annual 31 Cent Scoop Night on Wednesday, April 27, 2011 from 5 p.m. – 10 p.m. at stores nationwide. During the event, Baskin-Robbins is thanking its guests by reducing prices of its 2.5 oz. ice cream scoops to 31 cents. The iconic brand is also “Scooping up Thanks for Our Firefighters” with a $100,000 donation to the National Fallen Firefighters Foundation (NFFF). During 31 Cent Scoop Night last year Baskin-Robbins scooped more than 4 million ice cream cups and cones! The NFFF, founded in 1992, honors America’s fallen fire heroes and their families by developing and expanding programs to recognize fallen heroes and assist their families and co-workers. As part of 31 Cent Scoop Night’s annual celebration, The Dunkin’ Donuts & Baskin-Robbins Community Foundation is once again making a $100,000 donation to support the National Fallen Firefighters Foundation. In addition, to encourage consumers to support NFFF programs, for the first time this year, ice cream enthusiasts will be able to donate via text message. Consumers can text 6333 (NFFF) to 50555 to make a personal $5 additional donation. * Consumers will receive a text message to their phone almost immediately asking them to reply with YES to confirm the donation. Any donations that are not confirmed with YES will not be complete. Anyone who makes a text donation will receive a thank you message. All proceeds of the donations go to help families of fallen firefighters through extremely difficult times. In addition, participating neighborhood Baskin-Robbins stores will support their local fire heroes by hosting hometown fire departments during 31 Cent Scoop Night as another way local firefighters can collect donations for their firehouses while joining the community and scooping ice cream for fun! Families can have an opportunity take pictures with their local heroes on a fire truck or talk with them about fire safety. Baskin-Robbins lovers can follow @BaskinRobbins on Twitter and become a fan on Facebook for exclusive updates about 31 Cent Scoop Night. To RSVP for 31 Cent Scoop Night or for additional information about the event go to the Baskin-Robbins Facebook event page or visit www.baskinrobbins.com. ** The cost of a 2.5 oz scoop of ice cream (or a 3 oz. Soft Serve cone) from 5 p.m. to 10 p.m. on April 27, 2011 will be 31 cents plus applicable tax. To ensure everyone can enjoy 31 Cent Scoop Night, there is a three scoop limit per person. The Dunkin’ Donuts & Baskin-Robbins Community Foundation brings together a wide network of stakeholders, including Baskin-Robbins franchisees, crew members and employees, to support those who serve in our communities. The focus of the Foundation is emergency response organizations and child-related causes. The goal of the Foundation is to help ensure that those heroes we depend on during a disaster have what they need to rise to any occasion, and to make a positive impact on the lives of children in the communities that we serve. To learn more about the Baskin-Robbins Community Foundation, please visit www.dunkinbrands.com/foundation. The United States Congress created the NFFF to lead a nationwide effort to remember America’s fallen firefighters. Since 1992, the nonprofit foundation has developed and expanded programs to honor fallen fire heroes and assist their families and coworkers. For more information on the Foundation and its programs visit www.firehero.org.